As managing director, Prathna works collaboratively with MLA’s Board of Directors to set overall strategic and operational objectives for the group. She is responsible for leading key activities of Maple Leaf Angels Capital Corporation and managing the MLA48 Fund I & II Limited Partnerships - Ontario’s first Angel funds making investment decisions in 48 hours. 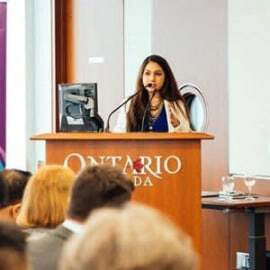 Prathna also serves as Chief Compliance Officer of MLA and is responsible for overseeing compliance within the organization and ensuring adherence to Ontario Securities Commission regulatory requirements, policies and procedures.